The paper deals with the development of a new internal combustion engine having a rotary piston. The introduction presents the short history of the evolution of the rotary combustion engines. The main part of the paper introduces the new patented internal combustion engine structure that has three rotational parts only: the rotary piston—rotor—, the rotary housing—rotary chamber—and the synchronizing gears. After the description of the structure, the work of the engine is discussed, compared to the usual internal combustion engines and the advantages and disadvantages are analyzed. Those properties that make possible the high speed operation are emphasized. Besides the constructional characteristics some manufacturing tasks are also presented, especially the very important precision finishing manufacturing of the working surfaces of the rotor and the rotary chamber. 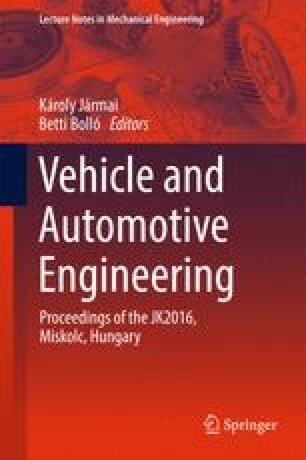 This research was partially carried out in the framework of the Center of Excellence of Mechatronics and Logistics at the University of Miskolc. The financial support is acknowledged.